I had watched carefully as the carpenter measured out the space for our bookshelves. He was a small man – no taller than five feet – but he had no trouble imagining our bookshelves as six feet high. I showed him some images on my computer of bookshelves and tv stands that I’d found online. He nodded, talked to Nisha in Hindi a bit and we agreed he would come back in one week. I asked him how much it would be. 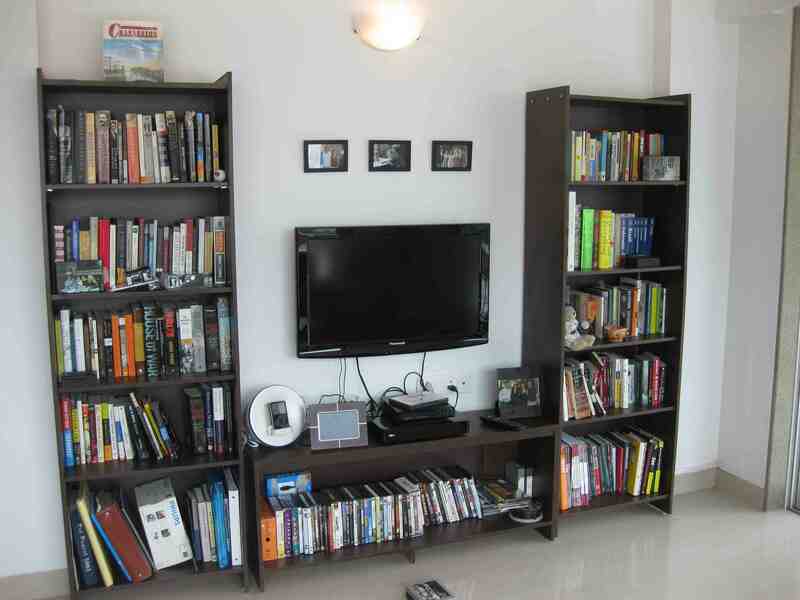 He calculated out each item – two bookshelves, one tv stand, and one entry table with shelves. “Six thousand?” he said. This was less than $130 for four pieces of custom made furniture. I still couldn’t get over it- I keep getting shocked by the low cost of anything custom-made. Of course, he worked on Indian time and the bookshelves actually took two weeks to make. And he tried to apply a ‘gora tax’, attemping to raise the price to 8,000 rupees for no particular reason (we still paid him 6,000). But now, here they are — our bookshelves and tv stand made to the exact dimension of our space. Yet while I marvel over my new bookshelves, I’m starting to realize that my love of all things ‘custom-made’ sets me apart from everyone else around me. Indians themselves place no premium on an item being custom-made. It’s a clear-cut case of ‘the grass is always greener’. Western people love custom-made items because they are exclusive – it implies that your item is special and probably more expensive. Indians, though, can have anything custom made. What they love is an imported item, or a well known brand (I’m going to pause here and say that I know this is a gross generalization. But it’s what I have observed for the most part). I had initially found it interesting that most Indians suggested furniture stores for our bookshelves instead of using a carpenter. Every single suggested store carried expensive imported furniture. All we wanted was something cheap, since we’re only here for a year. But no one could fathom that we would rather have something custom made, even if it was cheaper. Nisha finally put us in touch with the carpenter she knew, but it was only after we’d driven around to various furniture stores. And this attitude pervades into other items as well. When Daniel asked around his office about getting suits made, most people were shocked. Why would he want a custom made suit when he is from New York and can go to Bloomingdales or Macys? Why wouldn’t he want the brand? It was a shocking response to Americans who wish they could have a suit custom made to their exact measurements. It’s also the same for women’s clothes. Expats run around looking for a great tailor to copy designs they see in magazines. Locals like to go to the chic Indian designer boutiques or the overpriced Western clothes in malls (although they will all get each item fixed by their tailor eventually). It makes sense – you always want what you can’t have (or what other people can’t have). In my case, I’m just glad we’ve got our bookshelves. They may not be imported, but they surely fit right into our space. When I asked our new driver where we could buy cheap plants for the apartment, I wasn’t expecting the place we ended up. We drove into Santacruz, a few miles north of Bandra. Once off the highway and down a long road, we started slowing down. “Ok, here ma’am,” the driver said. I looked out my window as he pulled over and stopped. I hadn’t noticed as we’d been driving, but the entire roadside was lined with plants. Plants up and down as far as the eye could see – trees, bushes, flowering plants, everything . And behind the rows and rows of flowers and trees were small slum houses. It was a jarring sight – colorful luscious plants hiding the homes of the people selling them. And the many sellers were out, watching us emerge from the car. We immediately got a sales pitch: “What you looking for? What you want? I have good plants, very good trees. Or flower you like? This one tree is 300 rupee,” one seller said, pointing at a large tree. “Teen-saw rupiya? Neh, neh” I replied, indicating that 300 rupees was too much. In reality 300 rupees is only $6 and change. It’s hard to see a five-foot tall tree for the price of a large ice cream in New York as a bad deal. But you can’t think like that here – if you constantly convert in your head you’ll allow yourself to be overcharged over and over again. You have to bargain for what is fair. As it’s been with most locals, the seller found even my very very limited Hindi quite surprising. No one expects me to know anything, so the most basic phrases and numbers get me far. I kept walking, with the hopes of now being taken more seriously. For shopping, this tactic has generally been working for me now that I’ve learned the basic numbers. And once I’ve confused people with my little bits of Hindi, I use a foolproof phrase that makes them like me as well (or at least gets them to laugh at me enough to like me a little bit more than they would normally). I had realized the power of this phrase a few days previously while negotiating with a man selling me bananas. “Kitna huah?” I’d asked (How much?). “Chalees rupiya?” He looked at me, surprised that I knew the word in Hindi for 40. “Neh, neh.” I said, knowing full well that a dozen bananas should be closer to 20 or 30 rupees. But I knew my white face was stopping him from treating me fairly. The banana seller laughed. I had asked him why he gave me a white person tax. He found this very amusing and immediately changed the price. With some price knowledge attached to a bit of humor I could at least escape some of price gauging that came with my race. Nisha started laughing immediately while the seller just looked at me. He started chuckling, clearly amused. He walked over to his fellow sellers and began to talk animatedly. He was telling them what I said and they all were looking over and smiling. I’d won them over – I was willing to make fun of myself and so now we could begin to bargain with real prices. We picked out one large tree and four medium flowering plants. After my cajoling and Nisha’s instance, all the plants together were priced at a more realistic 345 rupees. 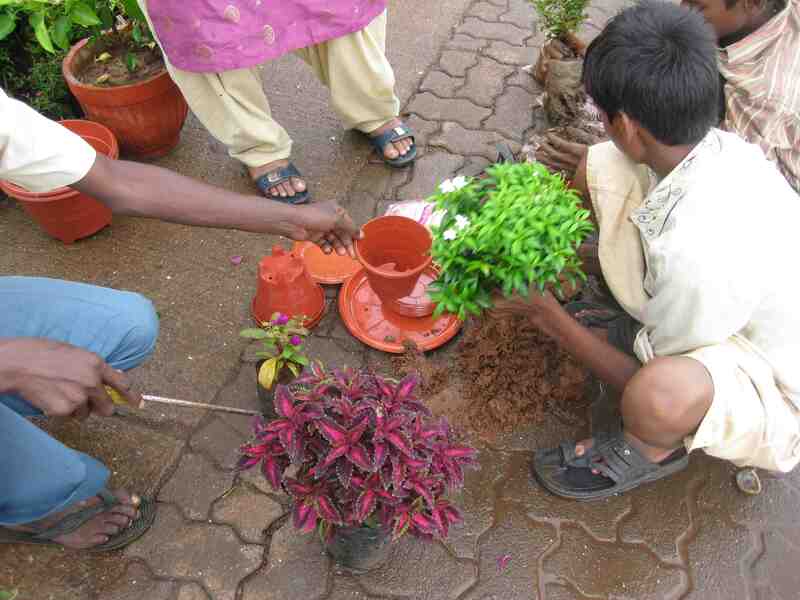 The young boys who’d been watching the negotiations intently were now instructed to begin potting the plants. They sat down on the wet ground, dug up mud, tenderly picked away old dirt from the roots, and placed my new plants in their containers. I’m not used to slums yet. It’s still hard for me to negotiate with a man when I can see that his house is barely standing and that he has no toilet or running water. But for this time at least I felt like everyone had gotten a fair shake – and perhaps a little amusement. I have learned a very important phrase in Hindi, one whose usage can have a grave impact on your wallet. Kitanā?, I can ask. And by saying this in Hindi I can be sure to reduce the cost of any item, even if the cost will still remain in the range of ‘white person price.’ The biggest problem, of course, if that I’m not far enough along in my Hindi to know what the responses to this question mean. Kitanā, as you may have guessed, means ‘How much?’. In my phrase-a-day approach to learning Hindi, this has been one of the more useful ones. People may get a kick out of me saying ‘Mujhē bhindi achee leh gee’ (I like okra very much) or ‘Tora, tora Hindi bolteh’ (I speak little, little Hindi), but it doesn’t have quite the disarming effect as showing a seller that you’re perhaps a bit wise to their games. Or at least wise enough to have learned the phrase, if not yet the numbers they respond with. But it’s still, of course, not enough to get a fair price. I think even a lifetime worth of Hindi and the long kurta’s I’ve been wearing wouldn’t get the price as low as if I just looked like I belonged. We went to the famed Crawford Market in South Bombay. It’s a building, its a neighborhood, it’s a conglomeration of shops and stands and street-hawkers. Everyone has something to sell no matter the size or shape of their stall or storefront; and every seller is ready to make a deal. It’s a tourist attraction and local haunt that’s known for its cheap wares and myriad inventory. We started out testing our pricing system with drying racks. I looked at a few and touched on the ones that we liked. We asked how much. It was 1,500 rupee (about $32). We scoffed and walked away. A few minutes later Nisha came back. 800 rupee was the new price. But when we went back together to pay, the price suddenly increased to 1,250. We knew we’d have to try and get most of what we were looking for at one place – where they’d have too much to lose if we walked away from all the items. While Nisha was searching for a singular place to purchase, I wandered over to a lighting store to look at standing lamps. “4,400 rupees,” the man said, clearly under the impression that $94 for his most basic cheap standing lamp was a reasonable price to offer a gora. “Nahee, Kitanā?” I asked (“No, how much”). “Ah. 2,500,” he replied, still ripping me off but with a little bit more realistic intentions. I walked out shaking my head at my own stupidity for even trying to negotiate in a place where people would never give me a reasonable rate. And as I walked, lost in thought, I stepped into one of the monsoon’s ubiquitous puddles, splashing mud into my waterproof shoes and covering my legs. I sighed in frustration. But a man in a nearby shop shouted my way and pointed at a bucket of water next to him with a ladle. I said “Shukriyaa” in thanks and began pouring the water down my legs. Here was a man who probably would have tried to screw me if I’d come into his store looking to buy something. But he saw me in distress and immediately wanted to help. It’s funny – the price structure isn’t personal here. It’s not malicious. It’s just everyone trying to make as much as they can off of the small sales they make. And for every moment that I get exasperated with India, the people here never fail to make me love them an instant later. It’s just the way it is. Nisha called me in to the shop she had selected and I thanked the man again for his help. I went in and she handed me a pre-written price list with all the items we needed. The owners weren’t going to haggle with me – they knew we’d walk away if they tried to change so many already agreed upon prices. We had found success. 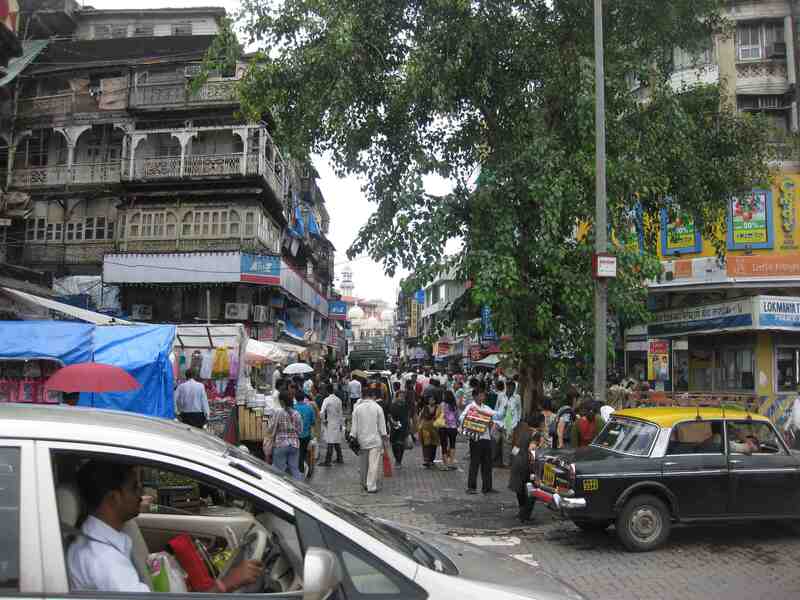 We spent the other portion of our shopping day in the opposite setting to Crawford Market. We pulled up to the Phoenix Mall and went into a store called Big Bazaar, which is like a dingier Bed Bath and Beyond with a grocery store thrown in the back. We picked up the items we couldn’t get at Crawford Market. But even at a mall that housed a Zara, Marks and Spencers, Burberry and McDonalds under one roof, you couldn’t stereotype it into a completely Western context. Upstairs in Big Bazaar you can go look at saris and kurtas. And when you walk into the grocery section you run smack into big tubs of rice and lentils, surrounded by prospective shoppers putting their hands in to test the quality. The two men in charge just scoop out bags and bags of the staples as customers flock to their most important section. It’s a comforting piece of an Indian market sitting in a grocery aisle lit by florescent lights and decorated with signs showing happy families in polo shirts and jeans. When we came back to our apartment, purchases in hand, we felt victory was ours. We’d gotten the basics we needed and we’d added some Indian cookware and flatware to our repertoire. But of course, when we tried to take it all upstairs the elevator had stopped working – and haggling and Hindi couldn’t buy us out of this one. Never a dull moment here – and never a time when we’re allowed to forget that we’re always going to have to try a little bit harder to make it all work.